There are common sounds that tell you that you are in Johannesburg’s Central Business District. The sound of the city is characterised by an unrelenting orchestra of hooting Siyaya and Quantum taxis, and the blaring mixture of kwaito, gospel and North African music from small foreign-owned shops and charismatic churches. Amongst this staccato of the city’s music is a choir of informal traders singing the same song from Wanderers to Klein streets – “I have what you want” … “How much you have?” … “I give you discount” … “I make you nice my sister, come I do your hair”. Each individual puts on their best performance with the hopes that their voice will be the one to capture a customer’s ear and maybe their wallet. SILENCE: Obinaddo sits quietly infront of his stalls at the Noord Linear Market. 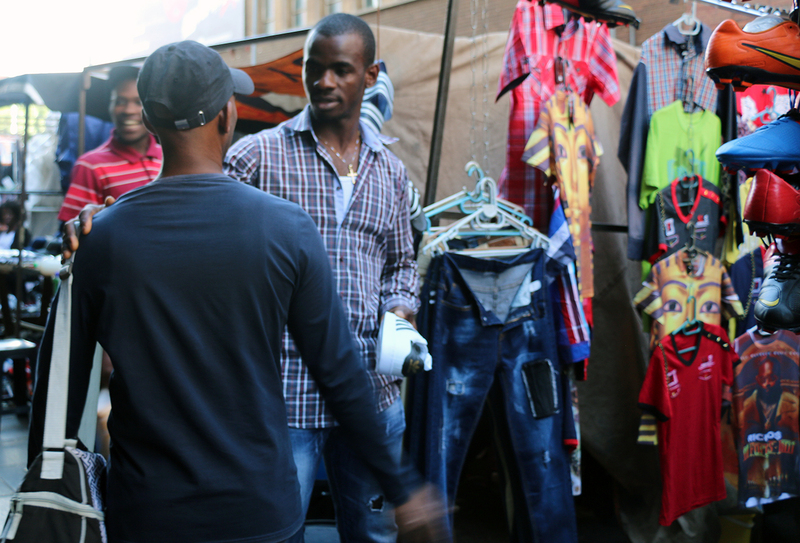 Anthony Obinaddo is one of many traders selling counterfeit clothes and shoes. In fact, right next to his protective gear, is a trader selling counterfeit clothing and again, next to his second stall, is another competitor also selling fake branded items. Despite the heavy competition at the market, Obinaddo is more of a conductor than a chorister. While his competitors belt out their sales pitches to potential customers and even drag them by the arms in the direction of their stalls, he sits silently on a plastic chair in front of his two stalls and watches as if his business runs itself. Obinaddo (27) a Nigerian trader sits in the front and centre of his two stalls at the Noord Linear Market. The first stall, on the left, is a table filled with protective boots and clothes hanging on the frame that surrounds it. On the second stall, to his right, is a table filled with a mixture of fake, branded sneakers and soccer boots that are enclosed by fake, branded t-shirts and pants on the frame around them. “I don’t know if it’s my style but I see it as harassment, you not forcing someone to buy what you want. If he got eyes he know what he wants,” Obinaddo says. His approach to business can also be attributed to his lack of experience in the market. Obinaddo only started trading eight months ago after he arrived in South Africa. “They call me ‘new boy’ or ‘fresh boy’,” he laughs. Obinnado continues to laugh as he reveals that his approach to business often means he “is always the loser” among his competitors. Even though he says his business is not doing well, he is able to employ two assistants, at R1200 per month, to help him with sales, as well as R2000 rent every month for his two stands. 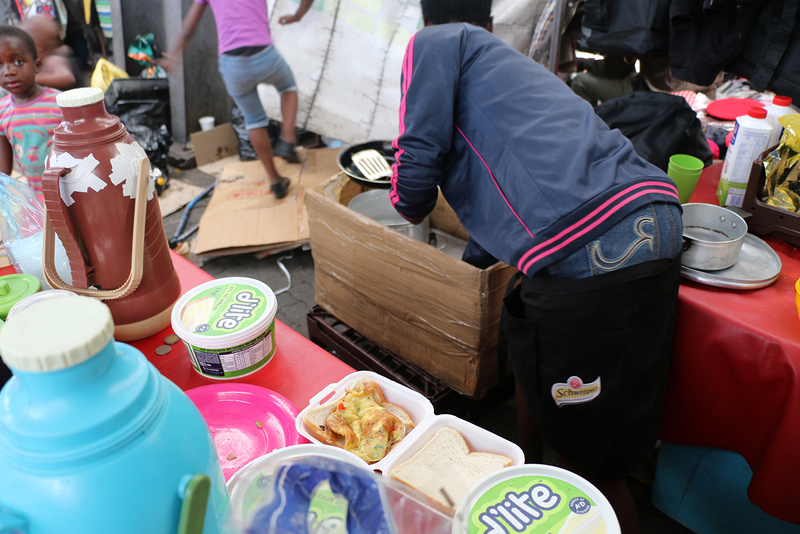 Directly across from Obinnado’s stall, Zimbabwean Sihle Dube (38), a single mother to a 13-year-old girl, struggles to make ends meet, selling omelette sandwiches and hot beverages. 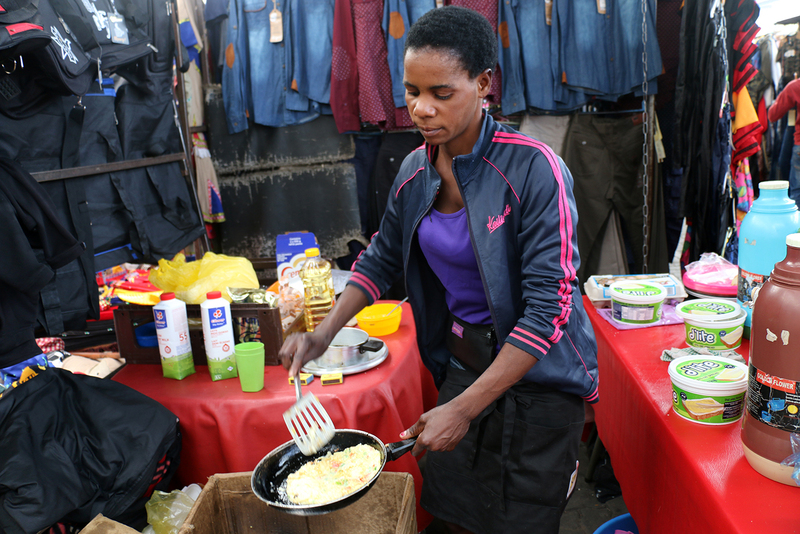 Dube and her cousin, Priscilla Ndlovu (34), come to the market every day between 5am and 6am to serve fluffy omelettes speckled with bits of green pepper, tomato and onions on sliced white or brown bread. Their drinks menu includes a choice of tea, coffee or Milo. SUNNYSIDE: Priscilla Ndlovu assists her cousin in the business of making eggs despite the fact that she sometimes doesn’t get a salary. Their busiest hours are from 7am to 9am, after which they sit and wait for customers to trickle in until 6pm when they pack up and go home. Dube has been operating from the same stall for 8 years and pays R400 monthly rent to its owner. It turns out that Dube has not paid Ndlovu her monthly R1200 salary for two months. Dube says she hardly sees any profit. Her monthly expenses include R500 rent at her flat, R400 rent for the stall, R1000 stokvel fee, R70 a week for storage in a building across the street, R20 per day to the boy who helps carry her items to storage and sometimes Ndlovu’s wage. When all of that is paid, Dube says her personal expenses are settled according to how good or bad business is on the day. 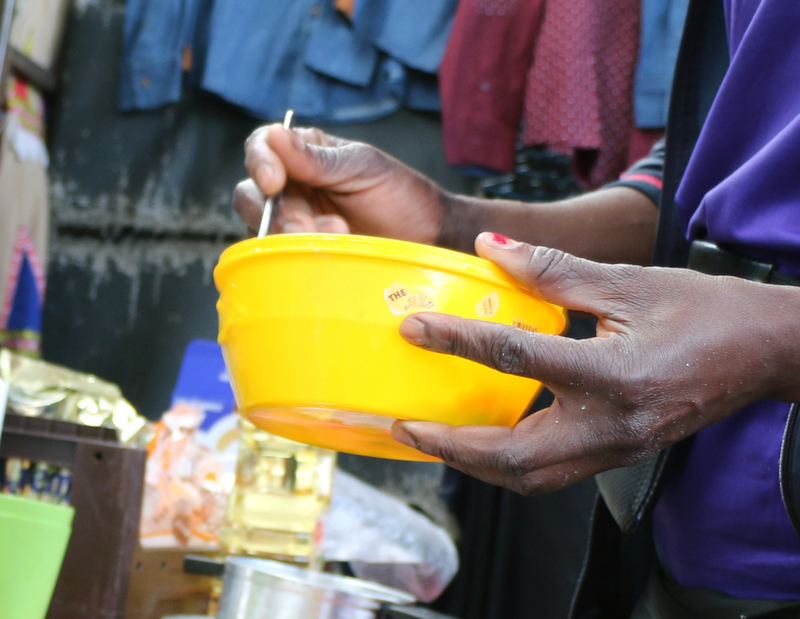 “I’m left out, I buy food little by little and even to send money to my daughter, I do it little by little” she says. Dube says the City of Johannesburg Municipality’s by-laws which are enforced by the Johannesburg Metro Police Department (JMPD) have dealt a hard blow to their business. Three years ago over 1200 informal traders claimed victory for interim relief at the Constitutional Court over mass evictions that took place under what was called “Operation Clean Sweep”. The City indiscriminately removed over a thousand legal and illegal informal traders from the inner city, an act which was described as “startling” by the court. The court criticised the City for infringing people’s dignity by taking away their ability to “earn money and support themselves and their families”. “Most of our customers are the ones who sell fake CDs, but the clean-up has removed them,” says Dube. The JMPD officials in their bright reflector jackets can be seen at almost every corner in the in the vicinity of Park Station. To a passer-by this is an image that immediately makes one feel secure, but for most hawkers, especially those trading illegally or selling fake goods, the sight of reflectors sends them packing their goods and running in a different direction. The officials remove and impound the goods of traders who are selling counterfeit goods or are in contravention of the by-laws. In the City’s by-laws street trading is defined as “selling goods or supplying services for reward in a public road; selling of goods in a designated area; sale of goods or services in a public place; mobile trading such as from caravans, and light motor vehicles; selling of goods in stalls or kiosks and selling of goods at special events”. Traders are required to trade in areas that have been demarcated by the municipality. The demarcations are made by means of a yellow paint line which indicates the area on the pavement where one can trade. Traders are only allowed to sell on these sites if they are in possession of a lease agreement that they apply for at the municipality. 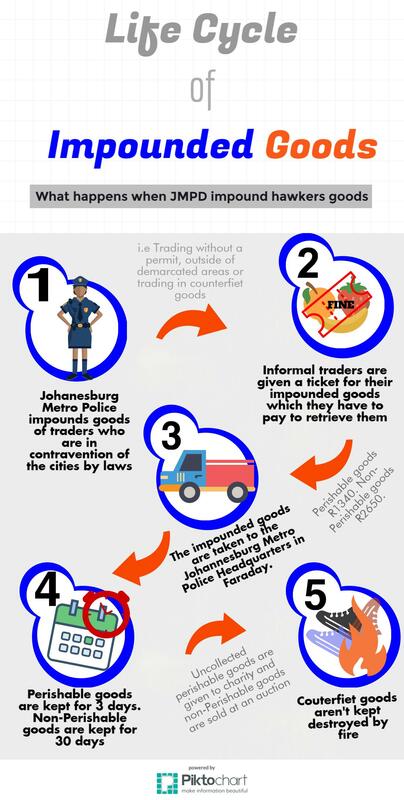 Traders who operate outside of demarcated areas often have their goods confiscated and given a fine of up to R500 or a sentence of three months in prison. This penalty also applies when traders fail to comply with the other long list of prohibitions outlined in the by-laws, from sleeping overnight at the place where a trader conducts business to making a fire and conducting trade in a way that creates a “nuisance”. A JMPD official who asked to remain anonymous says he personally doesn’t have a problem with hawkers in the city, given that there’s “law and order”. “Our people are surviving from selling on the streets. It’s not always that easy though. “I felt bad and let her go” says he says. The JMPD carry out their inspections sporadically, which is why the hawkers have learnt to protect their livelihoods. “In the Bible we know that there is Judas. So among them there is Judas” say Valentine Henry (27) a Nigerian trader who sells counterfeit shoes and clothing on De Villiers Street. Henry says they often get information about a coming clean-up from a rouge JMPD official, which gives them enough time to pack their stock and leave. It’s Sunday night and Dube and her two cousins are eating Sunday kos in the room they rent in a flat in Hillbrow. Dube eats from the double bed that she shares with her cousins while Ndlovu and Nthombelang Tshuma, the third cousin, sit and eat at the foot of the bed in front of the TV. The cousins share the one bedroom flat with five other people. The lounge is sectioned off into rooms using curtains for walls for the five other tenants. Dube and her cousins rent the bedroom which is furnished with a fridge, bed, a two-plate stove on a stand and a TV placed on a small room divider. Dube scrolls through her phone to share the many pictures she took of her 13-year-old daughter, during her recent trip to Bulawayo in Zimbabwe. Her daughter is the last of her immediate family. In 2003 her husband died after suffering from a long stomach illness which he had when he was deported back to Zimbabwe after being detained at the infamous Lindela Repartriation Centre in 2002. Dube was two months pregnant with her daughter when her husband died. Shortly after his death her two-year-old son also fell sick with a mysterious stomach illness. She says he was sick for a long time, she even gave birth while he was sick. Eventually in March, 2004 he died. Two months after her son’s death Dube’s mother passed away too. “Mama was not sick. I think she died of heartache from seeing her only child lose so much,” says Dube. Thereafter she stayed with her aunt who took care of her until her daughter was a year old. Her aunt then told her to go find work. She then decided to come to South Africa in 2005. Dube says she had to move on to save her life. “I saw that the stress was going to end up killing me. Kuyafika sometimes but ngiyakhona ukuk’ignora (The pain comes back now and then but I can ignore it),” she says. She had to send her daughter back to her aunt in Zimbabwe when she was in Grade three because the school fees were expensive. KIDS: Infants and toddlers can be found everywhere at the market because most hawkers cannot afford childminding services. Dube and her cousins do not see an alternative to their sandwiches and hot beverages business. “Uzothengisani (what are you going to sell)?” asks Ndlovu. “AmaNigeria are everywhere, they sell shoes, buckets namahairpiece, you have to be different,” says Ndlovu. However, the issue of a saturated market has not stopped Henry who has been selling on the streets since he arrived in South Africa in 2014. “If I have family here and wife and children, I can take care of them,” says Henry. He starts selling at 7am every morning and hardly takes a day off even though he has someone working with him. Both Henry and Dube are absent on days when they have to go to church. Dube goes to church on Saturdays at 10am while Henry attends a 7am Catholic Church service on Sundays for an hour. He is well attuned to the tricks of the trade and says it didn’t take him long to pick up on Zulu because the “gogos can’t speak English”, so he learnt to speak it. On top of his hands-on approach, Henry has learnt to be an aggressive salesman in order to survive in this tough industry. He watches customers like a hawk, stopping anyone who even sneezes in the direction of his stall. He says the trick is to price goods with enough room to negotiate a discount. “The minimum profit I am willing to make is R40” he says. However giving discounts is just one of his many tricks. “I like to handle my things my own way,” he says as he shouts something in Igbo to his assistant who is struggling to convince a customer to buy a pair of red and brown Puma sneakers. 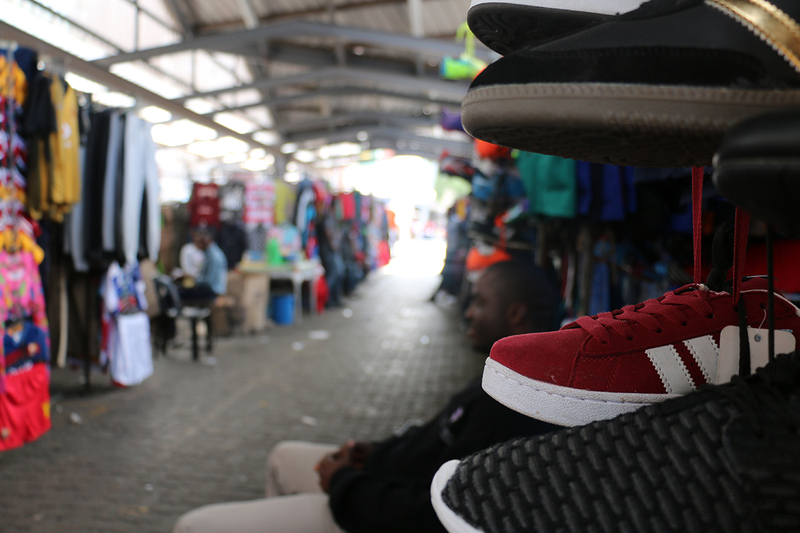 AUTHENTIC FAKES: Most street vendors buy their stock from a warehouse in Jeppe Street, only trusted customers are allowed entry. “Do you know what I just said?” asks Henry. He leans forward and explains that the man wanted to know if the sneakers were real or fake. “Customers, they can buy, you need to convince them. Look now he is putting it on because he is convinced,” he says with a smug look on his face as he pockets R250. Henry says he has learnt to negotiate and bases his argument on what the customer says. According to him most of these counterfeit items have characteristics which make them look authentic such as stitches inside the shoe. “You show him one without stitches and one with stitches, he will be convinced,” he says. Most of Henry’s and Obinadda’s stock is brought in from Mozambique by second party suppliers who have a warehouse in Jeppe Street. The most authentic looking sneakers, are those brought in from Mozambique whereas the South African counterfeits look fake. SALES: Competition is tough in these streets and often the most aggressive salesman wins. 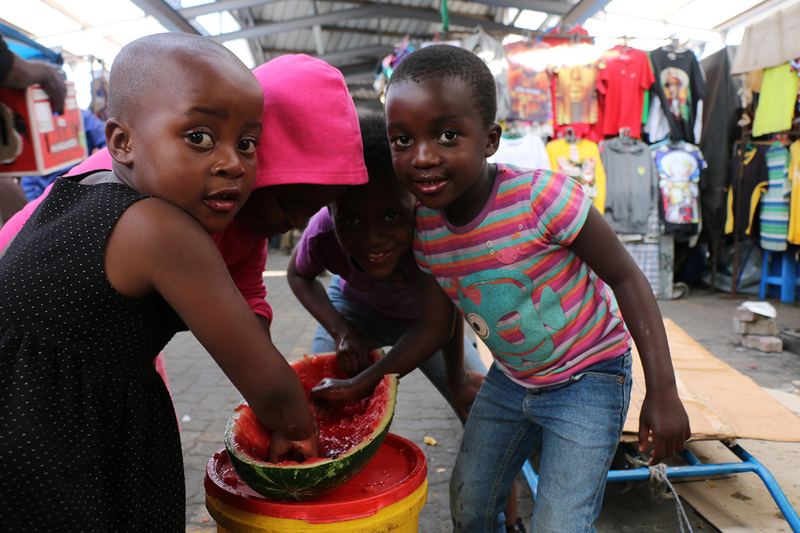 Currently Dube and her cousins are hoping to raise enough money to buy a three-plate gas stove so that they can start selling “iplate”, a serving of pap/rice with meat and vegetables. She makes her omelettes on a single plate gas stove encircled by a rectangular cardboard box with dark oil stains. “The problem is the people [other hawkers] here, they don’t want amapapa la. They say it will make their clothes dirty,” says Dube as she points to a neighbouring stall lined with formal pants. Right behind her by her stove is a wall of travel bags and school bags belonging to another trader. 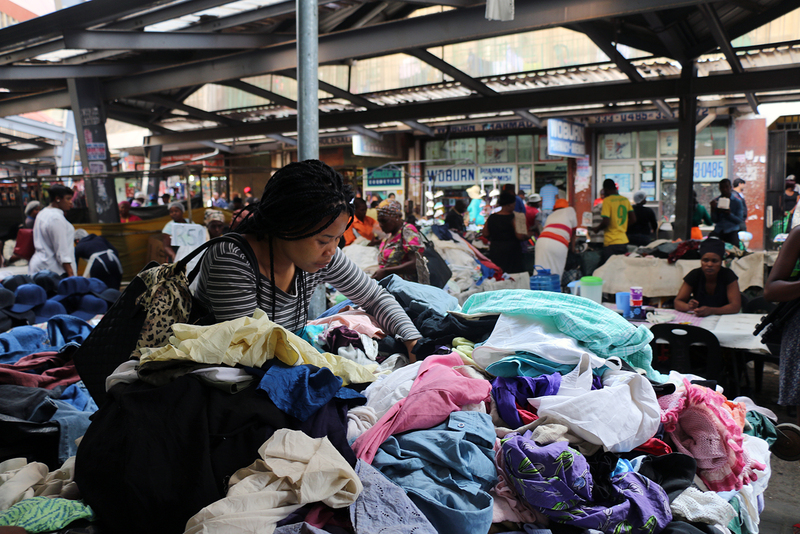 The crammed and intimate conditions of the market make it crucial for Dube to not step on people’s toes. She is aware of this. Which is why she feels her only option is to move in order to start her new business. A three-plate stove is just a pipe dream now as Dube does not make enough money to save for it but she’s optimistic that she will get it. “We hope that God will make things right,” she sighs. Dube has even bigger dreams. She hopes to make enough money to build a house and a supermarket back home in Zimbabwe. “To work for another person? I can’t!” she says.